As a demonstrator, one of the perks is a monthly magazine from Stampin' Up! loaded with all kinds of goodies and info! My favorite column is the technique based column in the magazine. I CASE-d a card from the March issue that taught a technique called acrylic distress. 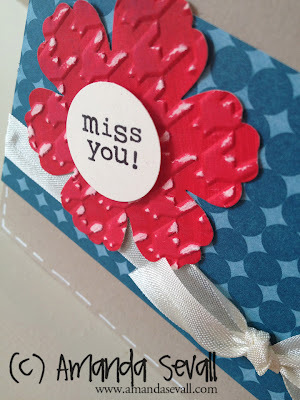 I used the same basic layout, ribbon type and placement -- the colors, punches and sentiment set used are my choice! First, paint your cardstock base and let it dry. Then, run it through your big shot to emboss. Next, sand the raised emboss to distress it. Now at this point you can come back with a sponge dauber to add a little ink to where you sanded or choose to leave it alone. I tested a little Basic Grey ink and a little Crumb Cake ink and didn't like the look on this particular card, so I didn't add any ink. My final step was to punch out my flower. 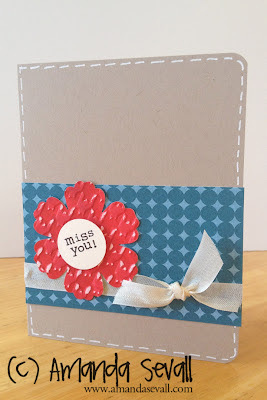 I added my punched sentiment using some Stampin' Dimensionals to add some depth and finished the card off using some seam binding and my favorite white pen to add some faux stitching.